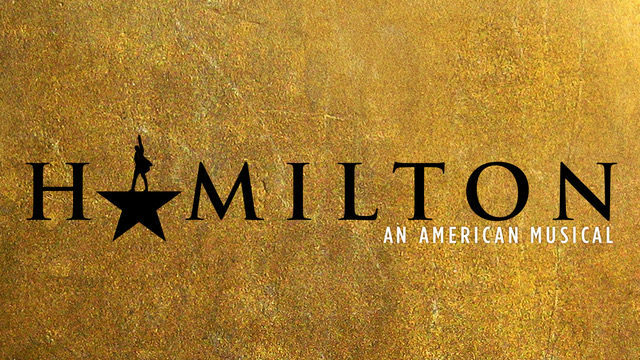 Purchase Hamilton tickets online, at the theatre box office, or by phone at 877-250-2929. The Richard Rodgers Theatre opened in 1924 and, originally called the 46th Street Theatre, it was renamed in 1990 to honor the legendary composer Richard Rodgers, whose shows defined Broadway for more than three decades. This theatre has been a house of hits, hosting a long line of famed musicals including Anything Goes, Guys and Dolls, Damn Yankees, How to Succeed in Business Without Really Trying, The Best Little Whorehouse in Texas, Nine, Chicago, and Movin’ Out. 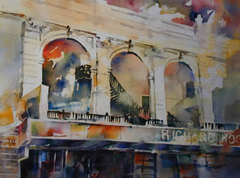 The theatre was refurbished in 2006 and houses The Richard Rodgers Gallery featuring historic memorabilia from its namesake’s storied career. Since 2015, the Tony Winner for Best Musical and international smash hit Hamilton has called the Richard Rodgers Theatre home. The Richard Rodgers has 1,319 seats and is one of The Nederlander Organization‘s nine Broadway theatres. The Richard Rodgers Theatre does not provide ticket refunds or exchanges. Patrons may not swap out or hold places in line. Each person may purchase up to two tickets. Regular price cancellation tickets will be sold in line order beginning approximately 30 minutes before the performance. Once a patron enters the box office to purchase tickets, he or she must proceed directly into the theatre. Only those purchasing tickets and attending that performance will be allowed into the box office. There is no dress code at the theatre. For all performances, attire should be comfortable and appropriate for the occasion. The theatre is air-conditioned during the summer months. The seating procedure for latecomers varies by seat section. Generally speaking, late patrons who are seated in the front orchestra are held in the auditorium until approximately 15 minutes after the performance begins. After that time, patrons are escorted directly to their seats by an usher. Video monitors displaying the performance are provided in the lobby. Smoking (including e-cigarettes) is prohibited in the Richard Rodgers Theatre. There are two bars located in the main lobby and one bar located on the mezzanine level where alcoholic and nonalcoholic beverages as well as snacks can be purchased. Bottled water and beverages with secure tops are permitted in the auditorium. The bars begin serving patrons 30 minutes prior to the start of the performance and at intermission. Male and female restrooms are located on the ground floor of the theatre. 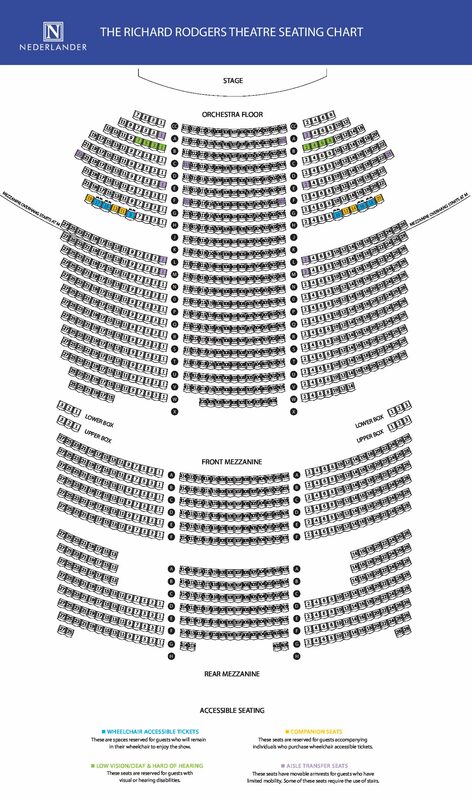 For guests with limited mobility, there are seats available with folding armrests (“Aisle transfer seats”) in these locations: Orchestra (no stairs): A1, A2, A101, C113, E1, E2, E23, E24, F101, F113; Orchestra (stairs required) L1, L2, M1, M2. For low vision/deaf and hard of hearing guests, accessible seats are available in the Orchestra B 1-7 and B 2-8. 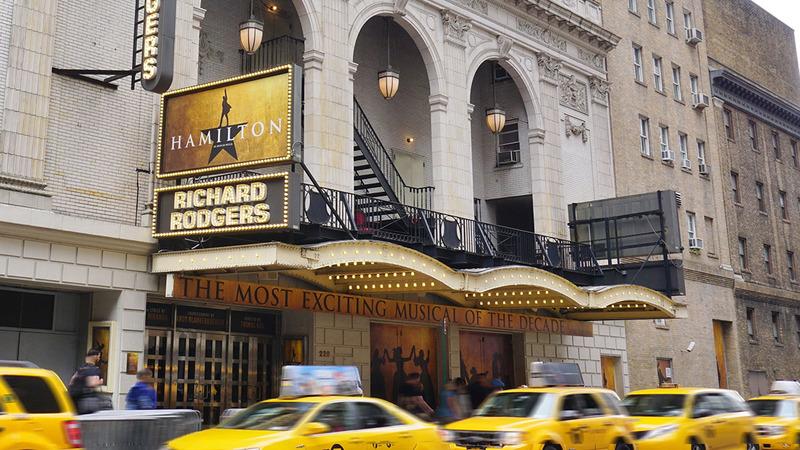 The Richard Rodgers Theatre is committed to the needs of patrons with disabilities. 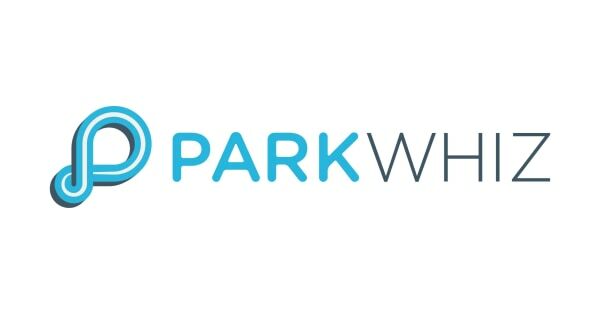 For more details on policies or assistance purchasing accessible seating, please contact us directly at 212-221-1211 or [email protected]. The Richard Rodgers is equipped with one wheelchair-accessible restroom in the theatre’s main lobby at street level. This area is strictly designated for guests with disabilities. Headsets for sound augmentation are available at the theatre, free of charge. A photo identification is required as a deposit. For patrons with a tele coil, this theatre is equipped with an induction loop. Please set your device to “T”. The Richard Rodgers provides “Audio Description For Our Patrons Who Are Blind or Partially Sighted,” a detailed account of the visual aspects of the production. The theatre also offers “I-Caption” hand-held devices that provide captioning for deaf or hard of hearing patrons. To honor the late composer, in 1990, the 46th Street Theatre was officially renamed the Richard Rodgers through the efforts of producer Alexander H. Cohen and the Nederlander Organization. This theatre, built in 1924, was also the first to utilize “democratic seating,” in which all patrons used the same entrance, whether they were heading to orchestra or balcony seats. Before Hamilton moved in and promised to keep the theatre filled to capacity for the next several years, the most recent productions have been Idina Menzel in If/Then; Condola Rashad and Orlando Bloom in Romeo and Juliet; Scarlett Johansson in Cat on a Hot Tin Roof; Lewis Black: Running on Empty; The Gershwins’ Porgy and Bess (two Tony Awards); Robin Williams in Bengal Tiger at the Baghdad Zoo; Lin-Manuel Miranda’s first Tony Award-winning musical, In the Heights; Cyrano de Bergerac; Tarzan; Movin’ Out; Private Lives; Neil Simon’s 45 Seconds From Broadway; Seussical; Footloose; Side Show; Steel Pier; How to Succeed in Business Without Really Trying; Laughter on the 23rd Floor; Fool Moon; Lost in Yonkers; Dustin Hoffman in The Merchant of Venice; James Earl Jones in Fences; and Raúl Juliá in Nine. The 1970s started with an enormous hit at the Rodgers: the revival of No, No, Nanette. There was also Raisin, a musical version of the play A Raisin the Sun; Maggie Smith in Private Lives; the original Chicago; and The Best Little Whorehouse in Texas. The great triple threat Gwen Verdon reigned here throughout the late 1950s, winning Tony Awards in three successive musicals—Damn Yankees, New Girl in Town, and Redhead. Shows in the 1960s included How to Succeed in Business Without Really Trying, which won Tonys for Robert Morse and Charles Nelson Reilly; Do I Hear a Waltz? ; Mary Martin and Robert Preston in I Do! I Do! ; and 1776. The 1950s began with Nanette Fabray, Pearl Bailey, and Georges Guetary in Arms and the Girl, followed by Frank Loesser’s Guys and Dolls. In 1954, Audrey Hepburn won a Tony Award for Ondine, which also won Tonys for Alfred Lunt (direction), Peter Larkin (sets), and Richard Whorf (costumes). A revival of the Rodgers and Hart musical On Your Toes starred Zorina, Bobby Van, and Elaine Stritch; and Patty McCormack terrified audiences in The Bad Seed, starring Nancy Kelly as her horrified mother. The 1940s saw the first time Ethel Merman’s name went up alone over the title with Panama Hattie. Dark of the Moon and Finian’s Rainbow were enormous hits, as were Mary Martin in One Touch of Venus and Eddie Foy Jr. in The Red Mill. Other vintage hits: Good News (1927), Hellzapoppin (1938), and DuBarry Was a Lady (1939).